The Vision/Traction Organizer™ (V/TO™) is the ultimate tool to make your dreams come true, and to execute on every aspect of your vision. We all have dreams. Dreams of doing big things, building successful businesses, gaining great wealth, and changing the world. However, very few of us every accomplish our dreams. Why is that? What is the difference between those who merely dream and those who achieve their vision? Having a clear vision is an absolute must to growing and scaling your business. If you don’t run your business on a business operating system or one that includes a systematic way to execute on your vision, we recommend you start now. The Vision/Traction Organizer (VTO) is a complete 2-page strategic plan that consists of The 8 Questions™. By completing the VTO, you will organize your plans to achieve your vision. Once complete, obsess over it daily, weekly, quarterly and annually. We suggest that you hand write your first versions of your Vision/Traction Organizer (VTO). It has been proven over and over again that writing your goals increases the likelihood that you will achieve them. The first step in creating your VTO is determining your Core Values. As Jim Collins and Jerry Porras discovered in Built to Last, great companies that endure over time have a timeless set of Core Values. Core Values are discovered. They are not aspirational, accidental or non-differentiating permission to play values. For this reason, they are a simple set of guiding principles that do not change over time. In order to make your vision a reality, you must first create your Core Values. Then surround yourself with people who share these values. You will want to hire, fire, review, reward and recognize your people based on these timeless principles. We use The People Analyzer™ as the ultimate tool to ensure we are surrounding ourselves with people who share our Core Values. If you consistently apply this methodology, you will build a great enduring company with a great culture. The second question you must answer in The Vision/Traction Organizer (VTO) is what is your Core Focus? Your Core Focus is made up of two hemispheres, your purpose, cause or passion and your niche. Your Core Focus has a singular purpose. It is intended to keep you laser focused on what you do and why you do it. Your Core Focus will help you make better decisions. It will keep you from being distracted. What is Your Purpose, Cause or Passion? The science of achievement has long held that in order to accomplish your goals, you must have a burning desire that has an emotional driver. In other words, if your goals don’t have emotional passion behind them they are unlikely to be accomplished. The same is true for your employees. If you don’t provide a clear purpose, cause or passion, your employees won’t have anything tangible to connect with. As with your Core Values, your purpose does not change over time. Your niche on the other hand can and will change as you execute on your plans. You need to communicate your purpose often. The Vision/Traction Organizer (VTO) is the right tool for the job. Your niche is your WHAT. It’s your specialization, it’s the one thing you and your organization can potentially do better than anyone else. When you are clear on your niche, you have to stay completely focused on it. Don’t be distracted by random opportunity. However, while your Core Values and you purpose, cause and passion should never change, your niche may need to change. The world is always moving, if you don’t allow for change in your niche it could put you out of business. For example, Kodak not adapting to digital technology even though it was in prime position to own the space way before anyone else. When you are totally clear on your Core Focus, you must ensure that all your systems, processes and people are aligned to deliver your niche at the highest levels of excellence. What is Your 10-Year Target™ or your Core Target™? The next question of The Vision/Traction Organizer (VTO) is what is your 10-Year Target. Your 10-Year Target is what that huge goal that makes your hands sweat it’s so scary. It’s that that thing you want for no other reason than you want it. It’s not logical and it may not even seem possible. That’s OK, it doesn’t have to. A great 10-Year Target is something that everyone in your organization can get behind. Some organizations what to take a huge company vacation, some want to be a $100 million business, some want to sell the organization for $10 Million and live on a beach. It doesn’t really matter what it is. It’s a goal that gets fixed in the mind of the leadership team and shared by the entire organization. Having a long-range objective gives meaning to the day to day grind of the organization. It helps you make better proactive decisions as opposed to being mired in the details. Having a clear 10-Year Target that you obsess over daily, weekly, quarterly and annually will make it more likely to become reality. The fourth question of The Vision/Traction Organizer (VTO) is, what is your Marketing Strategy. Most organizations don’t take the time to clearly define who they are selling to. Rarely do entrepreneurs take the time to obsess about the intent and context of their ideal customers. The Marketing Strategy is made up of four parts. First we must create what we call “The List”. Second, what are our Three Uniques. Third, what is our Proven Process. Lastly, what is our guarantee. What are your ideal customers goals and values? What sources of information do they use (books, blogs, gurus, conferences, etc.)? What are their challenges and pain points? What are their objections in the purchasing process? What quote do they live by? Within what radius am I looking? Where am I willing to go/ship to? What words do your best customers use when describing you? What unique experience or process do you provide? You can’t be all things to all people. If you do, your profits will suffer. Once you are clear on these differentiators, you must include them in the copy for all your sales and marketing materials. It’s also important to communicates these often to your employees as well as your customers. They won’t hear it initially, you must repeat yourself often. What is Your Proven Process? Having a Proven Process is a critical piece of your Marketing Strategy. It is a next level sales and marketing tool that communicates the customer experience. The graphically illustrated Proven Process has deep psychological roots and invokes the customers need to finish what they start, make progress, and build trust and certainty. For this reason, you’d be crazy not to have one. A point often overlooked, is that a great Proven Process forces your organization to perform at a higher level. Once you’ve communicated the process to the customer, you must fully deliver with absolute consistency. 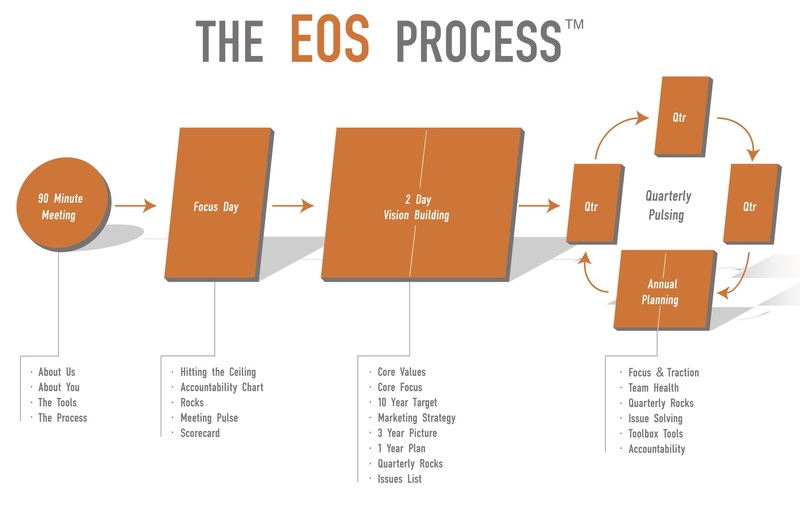 Here’s an example of the EOS® proven process. Note the circular appearance at the end of the process. This communicates to the client or customer an ongoing relationship. You will want the same thing in your process. Let your customers know we are in this together and it is intended to be a long-lasting and trusting relationship. The last step to a great marketing strategy, is to decide on your guarantee. What can you say to your customer to proactively reduce the risk of them working with you. It needs to be meaningful. For example, “if you don’t get value, don’t pay.” is a guarantee that puts no risk on the client. It says “if you don’t like the service, and you don’t value it, don’t pay me.” Simple enough. Your job is to agree upon your guarantee. Often times clients are afraid that the guarantee will cost them money. It may, however, it will be worth it and it will force you to provide better products and services. What is Your 3-Year Picture? The fifth question of The Vision/Traction Organizer (VTO), is what is your 3-Year Picture. This is what Cameron Herald calls in Double, Double, your “Vivid Vision”. This vivid vision is where you break down that 10-Year Target into a more actionable plan. It’s much more effective than huge 100-page strategic plans because it’s easy to share and communicate. And, let’s face it, we are just making up our future as we go and a 15-point list will do just fine. The first step in creating your 3-Year Picture is to agree upon the revenue, profit and a measurable for the business, just three short year from now. Once you agree to that, the job is to simply describe what the business will look like in bullet fashion. Keep the list simple and actionable. Use descriptive language. Read through your 3-Year Picture, every morning as part of your daily routine. Review it at least once per quarter with your team. If you can create this habit, you will achieve your vision for you business and for your life. Using your 3-Year Picture as the raw material for you 1-Year Plan you must prioritize the top 3-7 things you need to get done this year. What has to be true for you to achieve your short term revenue and profit goals? These are your big company objectives for the year. Each goal should be S.M.A.R.T. Meaning each goal must be specific, measurable, attainable, realistic and timely. Do not use words like “more” or “increase”. It’s not specific. Successful goal setting requires specificity. Equally important to setting your goals, is to create the budget to support it. If you create a great set of goals, but don’t have the financial capability to execute it won’t do you much good. The important part here is that you think through the financial aspects of your 1-Year Plan. As with other aspects of The Vision/Traction Organizer (VTO), do yourself a favor and obsess over your 1-Year Plan daily, if something isn’t sitting right with you make it an issue with your team. If everything is a priority, nothing is. Rocks are the absolute most important things that must get done in the next 90-days. Using your 1-year Plan as your guide, you and your leadership team have to decide and agree upon the 3-7 most important things to get done now. You can’t do it all. You only have a finite amount of time, energy, money and human resources. By documenting your 90-Day Rocks, or goals, in your Vision/Traction Organizer (VTO), you are creating a guidepost for the rest of the organization. You are intentionally directing all the human energy of the organization. Humans have a way of losing focus every 90-days and this will keep you on-track. Not only do Rocks provide you with focus, it adds accountability to the team. When you are setting your Rocks make sure that only one person owns the execution and completion of the Rock. If more than one person is accountable, no one is and the probability of completion is lowered. As with your 1-Year goals, when writing your Rocks they must be S.M.A.RT. Don’t make them squishy. Your language should be clear and concise so you know what success looks like. Don’t plan out the entire years Rocks ahead of time. Just focus on one quarter at a time. Sometimes our plans take us off track so by waiting to set your goals you allow for course correction. This allows you to be flexible and adjust to the world around you as it comes. Review your Rocks daily and obsess over them. In addition, review them weekly with your team in a weekly meeting and make sure everything is on track for completion. Finally, the last question of The Vision/Traction Organizer (VTO), is what are your issues? In this final section, you are documenting all your opportunities, ideas, obstacles, and barriers that are preventing you from executing on your vision. However, these issues are things you will have to solve in the future. You have bigger issues that you need to solve now, but these issues will need to be addressed beyond the next 90 days. The VTO Issues List is your parking lot. It’s the place you put ideas that pop into your head while in the shower but you know you’d be chasing shiny stuff this quarter if pursued. It’s a list of the constraints and issues you have in the business but don’t have the people, energy or time to solve this quarter. As Ryan Holiday wrote, “The Obstacle is The Way.” Your issues are a gift. They are pure gold within your organization. Pay attention to employee complaints. They are providing you with the path to achieve your vision, make sure you put them on your Issues List and review them with your team every quarter. There are two types of Issues List in the EOS® process, the VTO Issues List, and the IDS list. The IDS list is where you Identify, Discuss, and Solve your issues in your weekly meeting with your team.